W.H. Auden is a modern poet, employed as a professor at the Oxford university in 1956. The threat caused by the second world war had its disastrous effects. 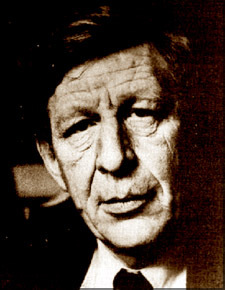 Auden seems to be influenced by the psychology of Freud.xl not being pleased with the unpleasant atmosphere left behind by the Industrial Development, he was "wrapped in amazement thinking how man could find peace and contentment amidst drastic changes and the darker perspectives of the people in the wartorn areas." In Auden's popular poem THE UNKNOWN CITIZEN he highlights the image of a person who has his rights to be free and happy a lifestyle, simple and "minding his own business" The subtitle JS/07/M/378 emphasises the fact that this citizen is only a file number to the state misfortune has dawned upon him depriving him of his actual name. A prisoner, having "forfeited his rights as a citizen by committing a crime" is called not by his name but by a number. This particular citizen has been honest, carrying out his duties, sociable and possessed all the requirements of the modern man. This satirical poem highlights the fact that a citizen is pushed to meet with the political and social norms, being concerned only about the ways and means of bringing profit to the organizations concerned. Banishing this sort of attitude Auden feels that a government is created by the citizens to protect them. Auden in an ironic manner emphasises the fact that the modern state moulds the man to serve and answer the needs of the state. Auden's diction style is simple yet idiomatic consisting of the rhythm of the spoken language. One against whom there was no official complaint"
"That in the modern sense of old fashioned word he was a saint"
Elevating this man and making him a distinct individual, Auden highlights the discrepancy between the ordinary man and the man possessed with extraordinary power. The rhyme pattern is superb and distinctive. Auden's imagery - verbal images and auditory images are quite distinctive. There's subtle humour reigning throughout. Auden's name shines as one of the most celebrated poets in English Literary works. Being rhythmical and metrical Auden's poetry inextricably mingled inviting the priority and appreciation of the reader.